446 pages | 44 Color Illus. | 122 B/W Illus. The Nile Expedition of 1860–1863 was one of the most important exploratory expeditions made in the nineteenth century. The long-debated question of the location of the source of the Nile was answered (despite continuing arguments) and the venture had important historical consequences. Earlier accounts of the expedition have assumed James Augustus Grant to have been no more than the loyal second-in-command to John Hanning Speke, the leader. 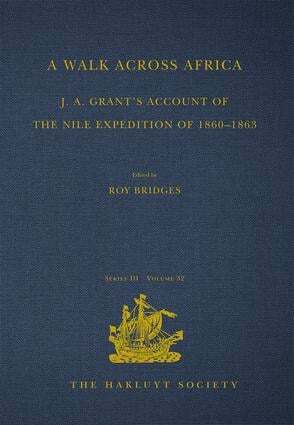 This new edition of Grant’s 1864 book, A Walk across Africa, provides the opportunity to re-examine his role. The original text has been fully annotated with explanatory notes and also supplemented by extracts from the very remarkable detailed day-to-day journal which Grant kept. Even more unusually, this edition includes reproductions of the whole visual record which he made consisting of 147 watercolours and sketches. This was the first ever visual record of large parts of East Africa and the Upper Nile Valley region. These documentary and illustrative materials have been drawn from the extensive collection of Grant’s papers now in the care of the National Library of Scotland. The Library has co-operated in the preparation of this volume to make possible its special features. Grant emerges as a much more impressive and important figure than has previously been recognised. He was a trained scientist and his narrative is a well-organised perspective on the expedition and its activities. His own growing understanding of Africa and of Africans becomes apparent and helps to explain his later activities. The editor provides a context to the expedition and its results and this includes a new approach to the understanding of the Nile source problem by exposing the credulity of the way many previous commentators have used Ptolemy’s information and also by suggesting that the problem should be approached in the light of geological and geomorphological as well as historical information. The Introduction in addition discusses Grant’s work in the light of the development of the academic understanding of the history of Africa and of European involvement in the region. APPENDIX A: List of Personal KitTaken with us from England for the Expedition. Roy Bridges is a Fellow of the Royal Geographical Society and of the Royal Historical Society and Emeritus Professor of History in the University of Aberdeen. After graduating from Keele and London Universities he taught at Makerere University in Uganda before joining Aberdeen. He has written extensively on exploration, especially of Africa, and believes it should be seen in the more general context of Africa’s history as well as that of the societies which sent the explorers. The work and career of Grant (also a product of Marischal College which became part of the University of Aberdeen) provides an excellent opportunity to illustrate this approach. A member of the Hakluyt Society since 1964, Roy Bridges has served on the Council on several occasions and had the honour to become President from 2004 to 2010. In 1996 he co-edited with Paul Hair Compassing the Vaste Globe of the Earth, a set of essays celebrating the 150th anniversary of the Society’s foundation including his own account of the Society’s founder, William Desborough Cooley. In 2006 came the Four Travel Journals volume which included his edition of ‘A Dangerous and Toilsome Journey’, the account by the freed slave Jacob Wainwright of the transportation of Dr Livingstone’s body to the coast. Professor Bridges lives ten miles north of Aberdeen in Newmachar, of which he has also written a history.